Tourists heading off to the beautiful Greek island of Santorini have, no doubt, fantasies of golden beaches, acres of palm trees and vibrant cocktails adorned with equally vibrant umbrellas. One image, however, probably hasn’t crossed their minds: a tired, dehydrated donkey, with aching bones from transporting overweight tourists, and open sores from inadequate bridle equipment. Although you’re unlikely to see that photo in any guide book, this is the reality when disembarking from a ferry on the island. Lively merchants try to persuade passengers that taking a “tourist taxi” up the 600 steps to the capital Fira is a “traditional Greek experience” and preferable to the three-minute cable car that’s the same price as a donkey ride. Neither are true. If you use these donkeys as transport, then you are directly involved in animal abuse. According to locals, frequent visitors to Santorini and animal right organisations, these donkeys are, more often than not, beaten, made to carry tourists who are too heavy, and are deprived of water, shade and adequate rest. One of the loudest voices on the issue is UK charity The Donkey Sanctuary, which has been providing free veterinary care for the Santorini donkeys for many years. It has also tried to provide training and equipment for the taxi operators, but the number of complaints has risen due to standards not being met. Changes to the route must be made so that donkeys can be rotated correctly. Double the amount of shelter is needed at the top and bottom of the cliffs, so that donkeys can be in shade while waiting. Fresh, clean water must be available to the animals at all times. Veterinary inspections must be carried out all through the season. Task inspections must be carried out every two weeks. 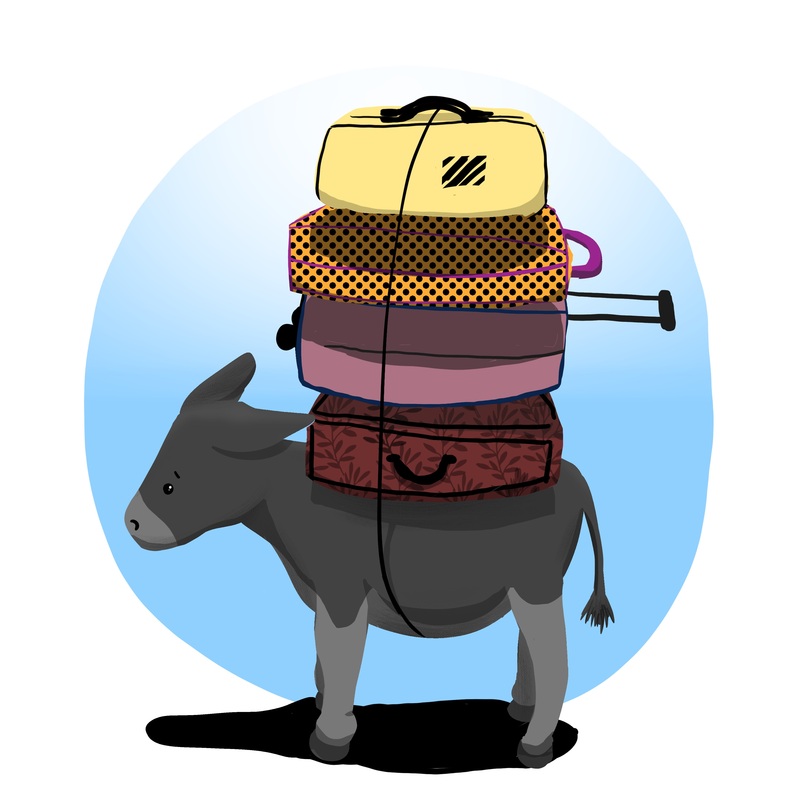 A weight limit on tourists carried by the donkeys must be imposed. The local codes of welfare practice need to be revised and updated, with evidence that they will be enforced. Admittedly, the walk up the 250-metre staircase path leading to Fira isn’t exactly enticing, even for the most avid walker, as it’s often laden with donkey droppings and urine. Many tales have been regaled of enthusiastic holidaymakers starting the climb, only to fall flat on their newly-stained chinos after encountering a literal slippery slope. Tourists are urged to take the nearby cable car instead, which takes just three minutes and costs the same as a donkey ride, at around five euros. With each ferry containing around 2,800 passengers, docking around half a dozen times each day, it’s understandable that numerous routes up the cliff have been made to beat the lengthy queues. Our advice is: please avoid the donkey rides. If you do feel compelled to ride one, however, then check the animal first to see if it is free from sores and bruises, well rested, fed and watered, and that its harness is in a good condition. It’s also advisable to take a look at yourself, to see if the donkey could hold your weight. This entry was posted in International and tagged animal cruelty, donkey rides, Greece, Santorini, tourist taxis. Bookmark the permalink. been saying it for 20 yrs!!! Greece is a hell hole for all animals,not just the donkeys! this needs to go global!!! shameful,the laws are not enforced, dogs are hung from trees,tortured…its terrible!!!! the donkeys like all animals on the islands have their 4 feet tied together -no shade,no water ,they can not even walk- its called pastouroma. Many things about Santorini remind me of Bali. Unfortunately, the oppression of animals for personal profit is one I didn’t expect in Greece. The sad and savage use of donkeys as tourist transport is archaic and needs to stop. The best way to encourage this is walk or take the cable car.